Loaded log flats crossing the trestle at the base of Bartle Hill. Heritage Junction Museum of McCloud, Inc.
Log flats represented the largest single class of equipment the McCloud River Railroad owned from its inception until the last logs rolled into McCloud in the early 1960's. Log flats are shown below in chronological order of their construction/acquisition. For the most part, these cars existed to haul logs from the woods east of McCloud to the sawmill. However, the company could and did press them into other services, such as lumber flats, gondolas for ballast service, and work/maintenance service. 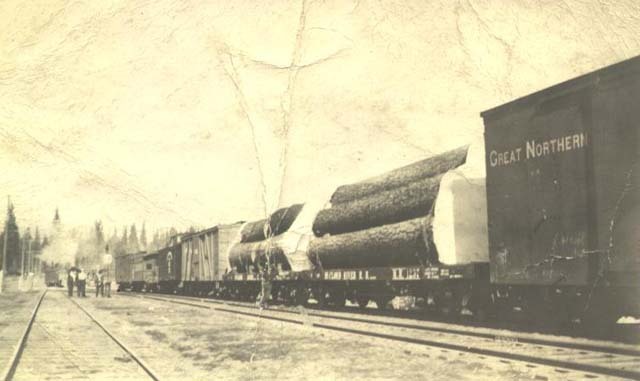 In 1917, company records indicate the shops equipped a number of log flats with temporary sides specifically to transport box shook from the McCloud plants to box factories, both served directly by the McCloud River Railroad or on the SP in the Mt. Shasta City area.
? ?-391 (Odd Numbers Only): 26-foot, mostly 25-ton capacity wood frame cars, all purchased or built prior to 1906. Post-1906 equipment registers start this series at #21; however, pre-1906 photographs of cars #15 and #19 exist. Eighteen cars wrecked on 3 August 1902. Most cars in this series retired or converted to other purposes (mostly water cars) in the mid-1910's, with a few cars hanging on into the mid-1920's. Last car from this series retired 4/1932. McCloud River log flat #249 with an impressive load of sugar pine logs. Marc Reusser collection. 541-639 (Odd Numbers): 36-foot, 25-ton capacity wood frame cars, all purchased new in March 1907 from American Car & Foundry Company, Chicago, IL. All cars in this series retired by 1926. 641-739 (Odd Numbers): 28-foot, 30-ton capacity wood frame cars, all purchased new in September 1907 from Russell, Detroit, Michigan. As built, side sills of cars only extended between the truck bolsters; all cars rebuilt with full length side sills between 1913-1915; several cars from this series extended to 40-foot length in 1919; all cars in this series retired 1924/1925. 743-841 (Odd Numbers): 28-foot, wood frame cars, all built in the McCloud shops between June 1910 and April 1911. All cars retired 1924-1925. 1201-1219 (Odd Numbers): 40-foot, 40-ton capacity wood frame cars, all built October 1912 in the McCloud car shop. All cars retired or converted to work service by 1953. 1221-1239 (Odd Numbers): 40-foot, 40-ton capacity wood frame cars, all built 1913-1914 in the McCloud car shop. All cars retired by 1949. 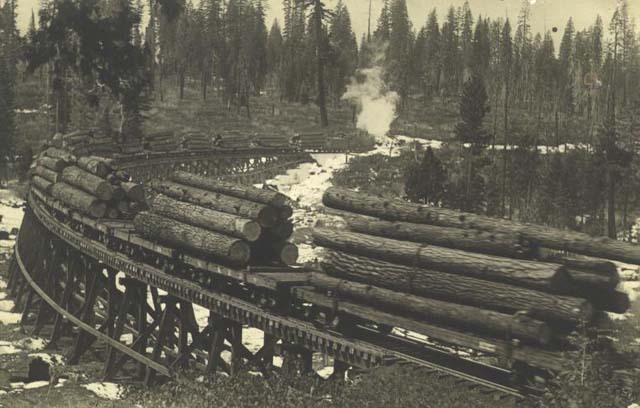 The McCloud River Railroad sent newly completed log flats #1237 and #1239 to the Panama-Pacific Exposition in 1915. The pair are seen here in McCloud just prior to their departure. Heritage Junction Museum of McCloud, Inc.
843-849 (Odd Numbers): 28-foot, wood frame cars, rebuilt in 1916 in the McCloud car shop from retired log flats #57, #125, #87, and #359. All four retired 1925. 1401-1517 (Odd Numbers): 40-foot, mostly 30-ton capacity wood frame cars, all built in 1916 in the McCloud car shop. All cars retired or converted to work service between 1932-1941. 1241-1289 (Odd Numbers): 40-foot, 40-ton capacity wood frame cars, all acquired new from Railway Manufacturing Agents in June 1923. All cars converted to work service or retired between 1932-1954. Log flat #1259 in the McCloud yards, with the roundhouse and back shop in the background. 1521-1699 (Odd Numbers): 40-foot, 30-ton capacity wood frame cars, all built in the McCloud car shop between 1924-1925. All rtired 1934-1941. 1901-1957 (Odd Numbers): 40-foot, 30-ton capacity wood frame cars, all built in the McCloud car shop between 1925-1926. All cars retired or converted to work service 1934-1941. 2101-2123 (Odd Numbers): 40-foot, 30-ton capacity wood frame cars, all built 1925 in the McCloud car shop. All retired 1934-1941. 1971-1999 (Odd Numbers): 40-foot, 30-ton capacity wood frame cars, built 1926 in the McCloud car shop. All cars retired or converted to work service between 1934 and 1941. 1959: 40-foot, 30-ton capacity wood frame car, converted from log flat #639 in the McCloud shop in June 1926. Retired 1939. 1961: 40-foot, 30-ton capacity wood frame car, converted from material car #583 in the McCloud car shop in October 1928. Retired 1940. 2125-2141 (Odd Numbers): 40-foot, 30-ton capacity, wood frame cars, rebuilt 1928 in the McCloud car shop from lumber flats #1007, #1029, #1041, #1003, #1009, #1015, #1035, #1039, and #1049. All cars retired between 1935-1946. 2143-2169 (Odd Numbers): 40-foot, 30-ton capacity, wood frame cars, rebuilt in the McCloud car shop in 1929 from lumber flats #1011, #1023, #1027, #1033, #1037, #1043, #1001, #1005, #1013, #1017, #1019, #1025, #1045, and #1047. Cars retired 1933-1941. 2201-2299 (Odd Numbers): 40- and 41-foot, 40-ton capacity, steel frame flats, all purchased 1929 as flat cars and then converted 1929-1937 to logging cars. All cars retired or converted to other services between 1940 and 1963. Log flat #2287 on the dead line in McCloud. A tree appears to have fallen across the car. Jeff Moore collection. 2301-2305 (Odd Numbers): 40-foot, 40-ton capacity, steel frame cars, rebuilt in 1934 in the McCloud car shop from boxcars #3027, #3045, and #3039. Retired between 1957 and 1963. 2307-2323 (Odd Numbers): 40-foot, 40-ton capacity, steel frame cars, rebuilt in 1935 in the McCloud car shops from box cars #3049, #3041, #3025, #3021, #3043, #3023, #3033, and #3047. Retired between 1957-1963. 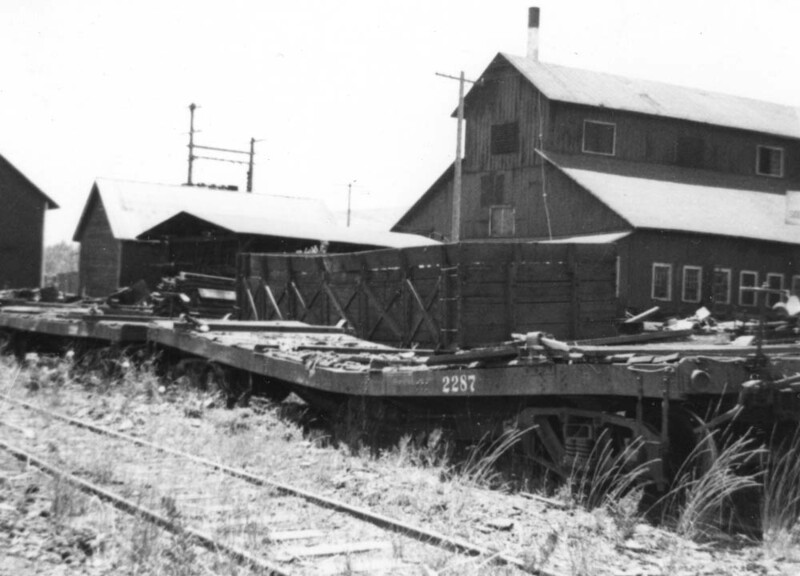 2601-2619 (Odd Numbers): 40-foot, 50-ton capacity, steel frame cars, acquired 1936 from the Southern Pacific. Retired between 1938-1963. 2621-2629 (Odd Numbers): 40-foot, 50-ton capacity, steel frame cars, purchased 1936. Converted to work service or retired 1957-1963. 2325, 2327: 40-foot, 40-ton capacity, steel frame cars, rebuilt in the McCloud car shop from boxcars #3029 and #3035 in 1938. Both converted to other service or retired by 1957. 2631-2853, 2857-2979 (Odd Numbers): 40-foot, 50-ton capacity, steel frame cars, all purchased from various sources between 1938 and 1941. All cars converted to other services or retired between 1944-1963. McCloud log flat #2671 in front of the McCloud car shop, with the #4 and a caboose languishing on the dead line in the background. From the T.E. "Eddy" Glover Collection. 2981: 40-foot, 50-ton capacity, steel frame car, built June 1946 in the McCloud carshop from the salvaged frame of an ex-Milwaukee Road boxcar destroyed in a fire at Pondosa Upper Yard. Converted to a maintenance flat. 2329: 40-foot, 40-ton capacity, steel frame car, built 1948 in the McCloud car shop from the fire damaged body of log flat #2267. Retired circa 1965. 2983: 40-foot, 50-ton capacity, steel frame car, built 1948 in the McCloud car shop from the salvaged frame of Atchison, Topeka & Santa Fe car #211936 (probably damaged in a wreck on the railroad). Retired 1963. 2985, 2987: 40-foot, 50-ton capacity, steel frame cars, rebuilt 1949-1950 in the McCloud car shop from wood rack flats #461 (definate) and probably #455 (likely). Retired or converted to work service by 1963. 2989: 40-foot, 50-ton capacity, steel frame car, built 1951 in the McCloud car shop from scrap material. Retired 1963. 3060-3082 (All Numbers): 40-foot, 40-ton capacity skeleton log cars, purchased 1955 from the Southern Pacific. All retired 1957-1960. 600-819 (All Numbers): 40-foot, 40-ton capacity, steel frame cars, rebuilt from Western Pacific #75801-#76232 series livestock cars. First one hundred cars purchased January 1957, with the remainder purchased December 1959. Most cars retired by 1964; 70 cars sold to Southwest Forest Industries for use on their logging railroad out of McNary, AZ; Bulk of remaining cars sold to either Dravo or D. Sutherland. The railroad retained a handfull of these cars for use in work service until 1971. Flats #604 and #607 in 1957, immediately after being released by the car shop. Jerry Lamper. In the mid-1990's, the McCloud Railway directed some marketing efforts at an unsuccessful attempt to return raw log traffic to the railroad. The railroad stored a number of ex-Weyerhaeuser Timber Company log flats for an equipment dealer, perhaps in anticipation of this traffic. The cars eventually left the property, with four of them going to the Santa Cruz, Big Trees & Pacific Railroad, who rebuilt them to passenger flats.